In the Lotus Sutra we read that ‘Only a buddha together with a buddha can fathom the Reality of All Existence’, a phrase that resonates through many different teachings. I would not claim to be a buddha, could not say for sure that I have met one, and I don’t think of fathoming Reality. A few years ago, though, it began to seem to me that we can have a intimation of that understanding when we meet someone. The word ‘meet’ is so commonplace that perhaps it needs to go into italics: when we meet someone. For many zen students, this experience first comes when sitting across from their teacher, where the unbroken wordless connection takes on deeper dimensions. When I started to teach, I found that at moments my ego, especially my karmic defendedness, was no longer in the way, and that a meeting could take place. In a practice community there are many given opportunities to practise this way of being with people. These days, there are times when I can move through the world and meet people like that in any space. The city is constantly throwing up moments and people, and I see the joys of allowing encounters to come and go. It is easy to do this with children, as they often ask nothing more of the world than that, and if shyness does not intervene, they offer it freely. At the risk of sounding kooky, I enjoy meeting trees and rocks, and in my shuso practice period four years ago, these meetings were just as energising as the teas where I met every student in the practice period. At other times, and I have been living through many of these recently, my defences kick in, my posture closes, and I find it almost impossible to take on this practice. I dwell in the suffering of my own body and mind, and closing energetically to people around me means I slip through the world unacknowledged. This fuels the delusion that I am a separate being, unconnected to the moments and people around me. Perhaps not incidentally, long walks in the quieter, greener parts of the city have helped alleviate this melancholy delusion, but I tend to find zazen a reliable antidote as well. On several occasions recently, sitting with inmates in the county jail, and being present for stories they wish to tell, have completely shifted my mood. It is not necessary to believe the stories, or to like the people telling them, for a meeting to take place; I just need to drop any sense of defendedness and separation, and I am always glad when my practice allows me to do this. And in these meetings, one of my deep karmic needs – to be seen, unbound – is also met, in ways that my karmic defended self did not anticipate. The power of the present moment unbinds the suffering of the past and the desire of the future, and in that there is, for those moments, liberation beyond words. This might seem tangential to what I was writing about yesterday, but perhaps this piece by Susan Piver, written a few days before the election, but perhaps more necessary in the aftermath, makes the connection clearer. When we can meet people, even deplorables, there is no othering. 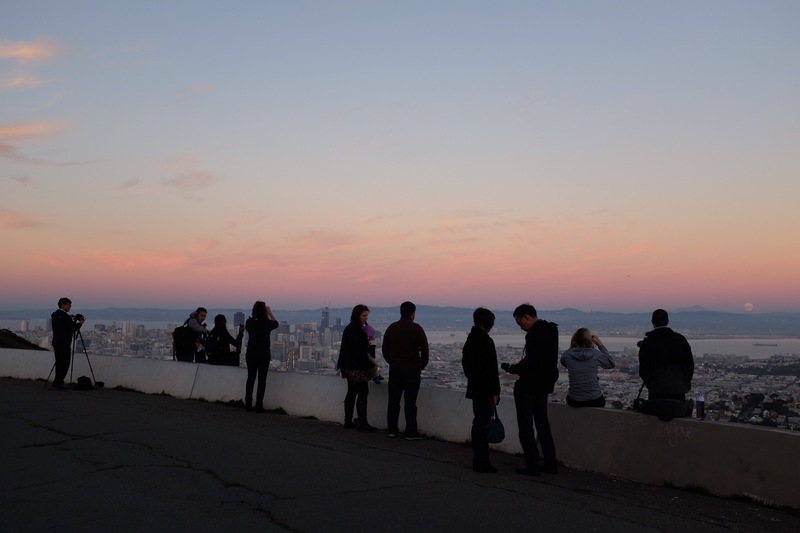 I took a long walk on Sunday afteroon, which happily brought me to Twin Peaks a little before the supermoon was due to rise. The sunset and moonrise could not have been more beautiful, and there was a wonderful feeling of sociability and communality among everyone I came across up there in the face of this experience. Thank you for sharing. What does experience of yourself feel like? What about the other times?